5G, the next generation in wireless communication is steadily coming closer to reality and naturally, each step that brings us closer to experiencing it ourselves is thoroughly celebrated. South Korea is ahead of the curve when it comes to 5G, its carriers have already launched their 5G networks but since there aren’t any 5G smartphones on the market, the faster speeds were only utilized by enterprise customers. But that was until now, SamMobile tells us. 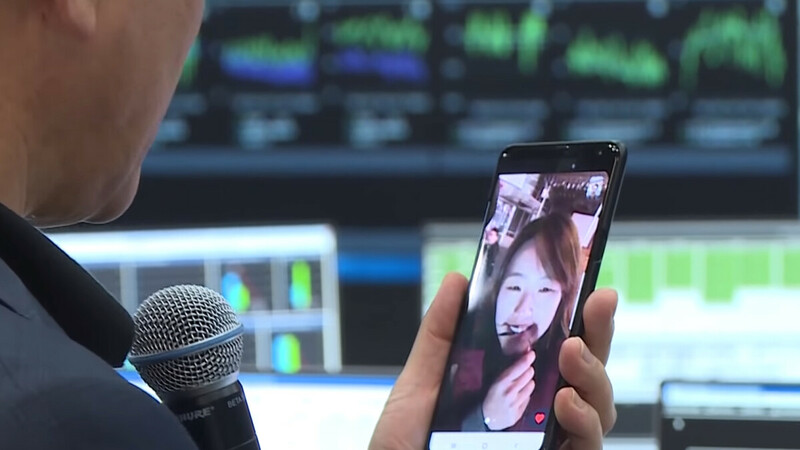 Using a custom smartphone provided by Samsung, Park Jung-ho, the CEO of SK Telecom video called a few of his employees in an operations center located in another city. This marks the first time a smartphone was used for 5G communication on a mobile carrier’s commercial network and not under testing conditions. Before you get excited the event might have included a sneak peek at Samsung’s upcoming Galaxy S10, we should say that this probably wasn't the case, considering the number of cameras broadcasting the event. However, while the phone in the video is cleverly disguised, as you might expect, it does have some interesting features. The case cutout for the main cameras shows a few sensors in horizontal formation but with no fingerprint reader under them. The front, meanwhile, is closer to that of a Galaxy S9+, but the top part of the display is black so we can't tell if there are thin bezels or a display hole for the front-facing camera. Of course, it's possible that Samsung has assembled a dedicated device using prototype parts to allow the use of 5G and nothing like it will see the market. “Samsung Electronics and SK Telecom worked closely together to speed up commercialization of 5G.” said DJ Koh, Samsung Mobile’s executive. The company’s first phone with 5G that people can actually buy is expected around March 2019 when the Galaxy S10 lineup is released. Leaks about the next flagship smartphones are steadily coming and you can easily keep up with them with our rumor overview. And while in South Korea the networks are ready and waiting for phones to use them, in the States the situation might be reversed. All four major carriers are working hard to have 5G available early next year with some 5G services already providing fast internet in your home. 5G will be invented by apple on 2020 and isheep fangays will be proud. Oh, that's all nice and dandy my dear but allow me to address the elephant in the room first. What about battery life? LTE chew through my iPhone 7's battery, way faster than my S6, probably because of it's piddly sub 2A battery hence I keep it in 3G most of the time which is beyond adequate. The thing is, 4G is fast enough unless you're one of those dorks who stream 4K videos on their bloody microscopic displays and brag about it so... Do we really need 5G on our smartphones? I'm more than happy with 3G, yes you read it right, 3G not 4G and I think 5G is just a big... Fart! Forgive my potty language and accept my heartiest; G'Day! The answer to the battery life problem is to buy a phone with a better antenna and bigger, longer lasting battery. iPhones are not great for this. For me 3G is far too slow and frustrating, 4G is the first mobile network that I find usable, 5G will just make that better and I welcome it. With today's bigger batteries, faster charging and better battery management software, phones should be able to manage 5G fine, but of course, time will tell.